Do you feel that the company where you work is taking advantage of the opportunities presented by IoT? What was the main reason for your IoT solutions? Click to download the survey and learn more! As regards the opportunities for Sweden to succeed with IoT, the opportunities are considered to be good in terms of infrastructure, innovation and knowledge. Just over one quarter have tried IoT in their organisation (more among those who consider the issues important from a sector perspective than from a company perspective), but few have used external resources. The reasons for introducing IoT solutions appear to be based primarily on concern for customers and to a lesser extent on a desire for new opportunities for income. 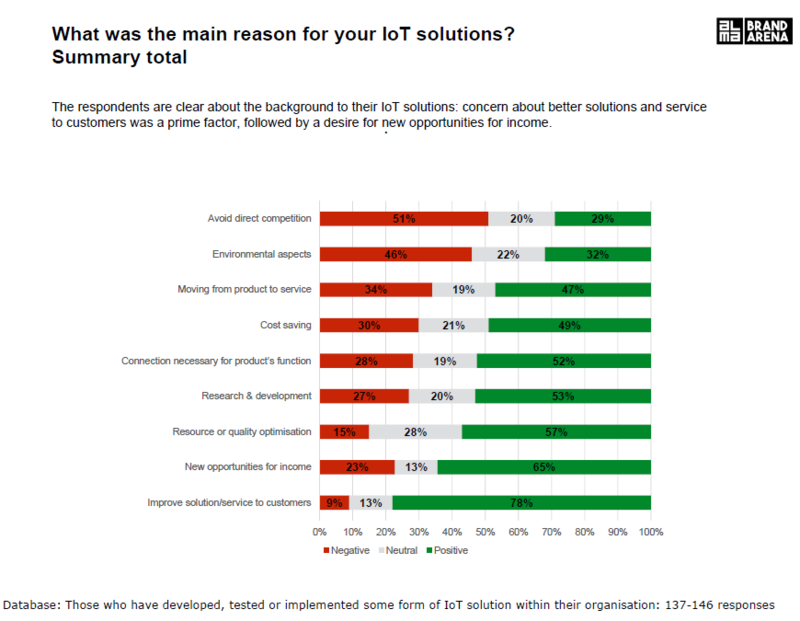 Here too we can see that those who consider the issue of IoT important from a sector perspective rather than their own company’s perspective are the most positive. Database: Those who have developed, tested or implemented some form of IoT solution within their organisation. Those who have not yet invested in IoT solutions give as a reason that they do not have internal resources or that they do not see any commercial benefit. 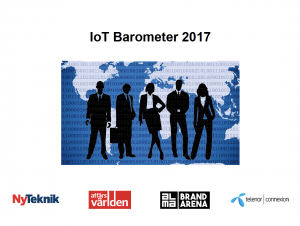 One third have IoT included in the company’s planning for the next 12 months, and the same proportion say that they have not. The main obstacles to succeeding with IoT projects are stated to be inadequate knowledge and competence, and more than half state that the organisation does not have enough information about how to go about implementing an IoT solution. One tenth state that they have abandoned an IoT solution during the past year. One person in five states that they are considering changing their business model because of an IoT solution, and more than half of these want to servicify: to move from selling products to selling services. The main responsibility for IoT rests with the CEO, according to one third of respondents.